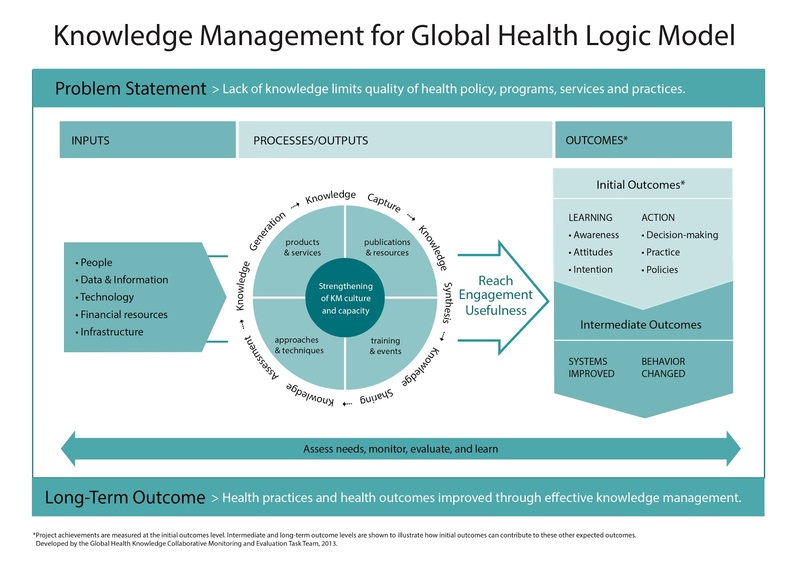 The Knowledge Management for Global Health (KM4GH) Logic Model is designed to help global public health professionals improve health programs. The KM4GH Logic Model shows how typical key logic model elements—inputs , processes , outputs , and outcomes —and program elements and activities relate to one another. KM activities are developed from inputs and processes and are intended to improve the performance of health professionals and/or organizations, which, ultimately, should help improve health outcomes at multiple levels. The goal of the KM4GH Logic Model is to provide general guidance on measuring the contribution of KM activities to determine which activities are most efficient and effective, and, in doing so, justify investment in KM. It is not a blueprint for any particular KM activity. Each activity should develop its own model, first considering the specific health situation and priorities of the setting.